(AP) Shopping center developer Kelly Doran, who put more than $1.6 million into his first shot at political office, quit the race for the DFL gubernatorial nomination Friday. Doran, of Eden Prairie, announced his decision at a Capitol news conference. He was briefly a U.S. Senate candidate before switching to the governor's race in September. His willingness to commit his personal fortune to his campaigns made him a legitimate contender despite his political inexperience. His departure changes the race. Democratic candidates can save more of their money for a general election campaign against Republican Gov. Tim Pawlenty instead of trying to keep up with the free-spending Doran through the primary. "It's big because it means the primary is not going to be as contentious as it would have been," said Democratic strategist Blois Olson, co-publisher of the online Politics in Minnesota newsletter. The major Democratic candidates remaining are Attorney General Mike Hatch, state Sen. Steve Kelley of Hopkins and Sen. Becky Lourey of Kerrick. Former Gov. Jesse Ventura's Independence Party is backing consultant Peter Hutchinson. Doran had struggled for tractin with DFL activists, and drew just 6 percent in a straw poll during precinct caucuses. Hatch grabbed nearly 40 percent of the vote, and Lourey and Kelley both attracted about 22 percent. Before and after the caucus poll, Doran insisted he wasn't depending on the party endorsement and was focusing his campaign on a September primary. He had already run a wave of television commercials introducing himself to voters and plastered billboards along highways across the state. 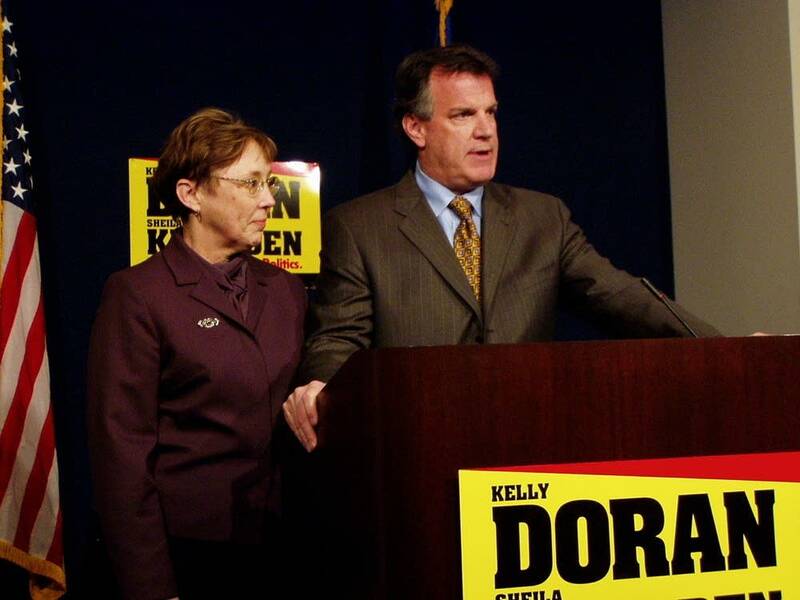 Doran, 48, had tried to claim the political middle, selling his outsider status as an asset and recruiting a moderate legislator - state Sen. Sheila Kiscaden of Rochester - as his running mate. But his campaign might be most defined by his balance sheet as he tried to build a political base from scratch. Doran spent $750,000 on his short-lived Senate campaign and another $900,000 through Dec. 31 on his run for governor. He entered the year with $1 million at the ready, but that too came from his own pocket.